I just bought this picture on ebay. 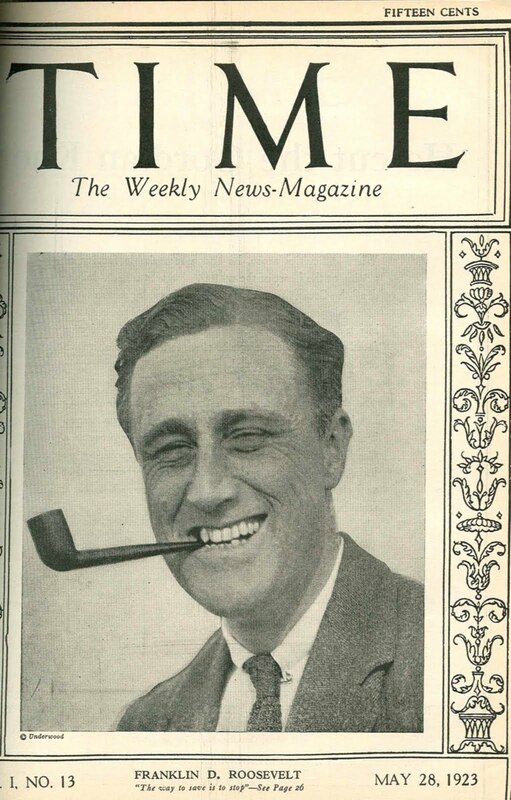 It is undoubtedly from 1920 and clearly shows the pigmented lesion over FDR's left eye. It is the earliest it can be seen (and believe you me I've looked at thousands of photos). The earliest prior photo is from TIME Magazine in 1923. As you can see it is quite benign appearing at this time and far less noticeable than the mole on his opposite cheek. Twenty-five years later it killed him, from a bleed into a brain metastasis. My paper in Neurology, the official publication of the American Academy of Neurology, appeared in yesterday's issue. I look forward to the comments of my colleagues. 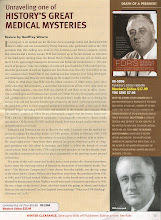 FDR's Many episodes of "the flu" and William Bradley Coley. I am presently involved in writing a biography of the great cancer fighter, George. T Pack, the founder and for many years the head of the gastric and mixed tumor service at Memorial Hospital (now Sloan Kettering) in New York City. Among his many accomplishments Pack was known as "Mr. Melanoma" for his treatment of this dermatological killer with surgery, radiation and other modalities such as immunotherapy. One method of immunotherapy used to fight melanoma in FDR's time by Pack were "vaccines" devised in the 1890's by bone surgeon Willam Bradley Coley. This included such proteinaceous mixtures as denatured Rabies virus. The quality of the therapy was judged by the amount of fever generated in reaction to the dosing. 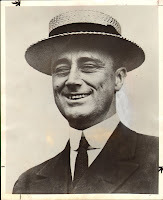 Of course my one track mind went immediately to FDR as I realized the potential impact of such a treatment upon him. Yet this does not explain the the countless episodes of presidential absences from view for days to weeks after 1935 or so. As everything else a highly educated guess: early immunotherapy for melanoma probably accounted for at least a few of these strange febrile episodes. When I told Ruben Oropeza, Dr. 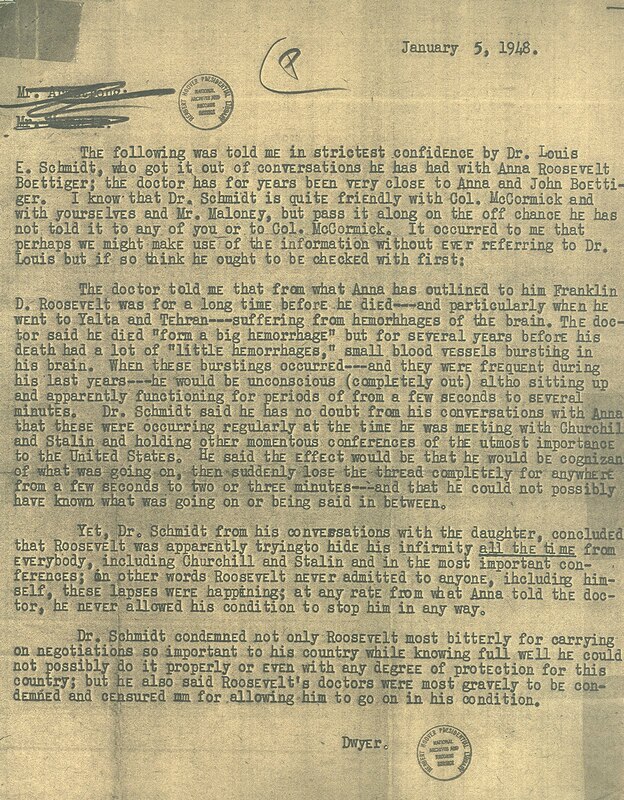 Pack's confidante (a la Daisy Suckley for FDR) about the removal of the melanoma in 1940, he immediately grasped why it could not be totally removed. As a man that removed thousands of melanomas over fifty years he aptly noted that, at the very least, the eyebrow would have to have been removed and "thrown in the bucket" along with the remainder of FDR's political career. FDR loved being Preseident more than life itself and, in the end, he payed the price to stay in office until the day he died. There are still many very learned skeptics about everything we have been preaching but, in time, the world will appreciate the truth about this remarkable man and not the fairy tale that be and his physicians concocted. My paper of this title will appear in the February 15th issue of NEUROLOGY, the most widely read amd prestigious peer-reviewed neurological journal in the world. In the last two years of his life, FDR manifesting frequent lapses of consciousness that lasted seconds to minutes that neurologists would recognize as complex partial seizures. Epilepsy is defined and more than one seizure and, as in the case of FDR, many forms of seizures do not involve convulsions. 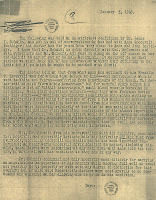 An event that probably occurred the day prior to FDR's last visit to Warm Springs may have been convulsive but there are no direct descriptions, only a report of a "brain hemorrhage" that rapidly cleared by Walter Trohan (who almost undoubtedly got ir from a secret service agent) in the News Story Magazine article linked to this blog. Brain hemorrhages do not clear with such rapidity. The only one that FDR undoubtedly experienced was on April 12, 1945 that killed him. In the opinion of this blogger, it was most likely brought about as a manifestation of bleeding from a metastatic melanoma of the brain, a circumstance that occurs as a terminal event in over one quarter of patients who die of this often fatal form of cancer. The paper describes three stunning eyewitness accounts (these are also in the book). Here is a document that came out after the book and that is perhaps the most dramatic, showing that his daughter Anna was well aware of the episodes but, as all other reports, did not recognize them for what they truly were. Now a bit of educated speculation. 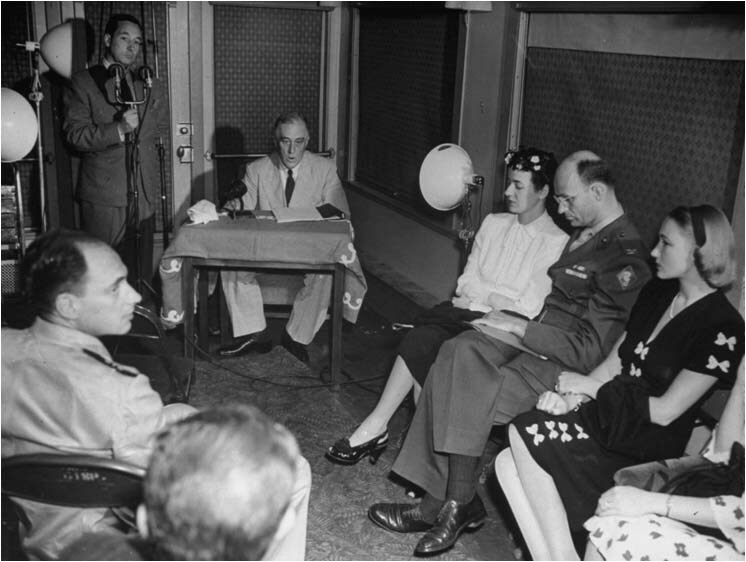 Based on the description of the events by Francis Perkins, Turner Catledge, Senator Frank Maloney and a dozen others, combined with thirty years of experience as a neurologist, it is possible that the photograph below caught FDR in the midst of one of his events. This photo is interesting for a number of reasons. It was taken near San Diego, in FDR's private railroad car, the Ferdinand Magellan, on the occasion of his acceptance of the Democratic nomination for a fourth term, appearing in LIFE Magazine and triggering a major FBI investigation. 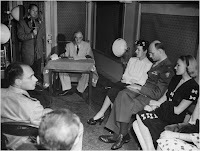 As it turns out, the balding naval officer in the foreground is none other than Howard Bruenn, whose constant presence at FDR's side at the time was supposed to be a secret. After a number of Bruenn's colleagues recognized the cardiologist, surmised he was there to treat presidential heart disease and started talking among themselves about it, J. Edgar Hoover and company were dispatched to "squelch the chatter" so to speak. This, of course, turned out to be only the top layer of many calculated deceptions with respect to FDR's health in 1944 and 1945. I will post the Neurology paper on the day of its publication.